Is The Future of Cars Not Owning One? While it may be hard to believe right now, many analysts predict that most North Americans will no longer own a car by 2030. That’s only 12 years away! Granted, these are American statistics, and we’ll have to wait to see exactly how the Canadian market is impacted, but our smaller population should see us adapt just as quickly. In April, Uber acquired Jump, the bike-sharing company, originally launched as Social Bicycles back in 2011. It currently runs a GPS-enabled bike share program in twelve cities across the globe, including a handful in the United States. In San Francisco, Jump provides electric and dockless e-bikes. Dockless e-bikes are GPS tracked, so they don’t require the same footprint as a charging station, making them an attractive option to congested cities. Uber no longer wants to be seen as only a taxi alternative; they want to be an urban mobility company, and this latest move is a step in the right direction. “We’re committed to bringing together multiple modes of transportation within the Uber app—so that you can choose the fastest or most affordable way to get where you’re going, whether that’s in an Uber, on a bike, on the subway, or more,” explained Uber CEO, Dara Khosrowshahi, in a recent blog post. The CEO has previously shared ambitions to run a city-wide transit system by allowing customers to purchase and use tickets through the Uber app. While not quite the same, Innisfil has already partnered with Uber to help bring subsidized, on-demand transit service to its residents, in the first partnership of its kind in Canada. Now others are looking to do something similar. By connecting customers to public transit and partnering with transit agencies, Uber is silencing critics that say they are monopolizing city infrastructure. Instead of taking customers away from public transit agencies, Uber is trying to get a slice of the pie. For those not keen on driving, Uber has also partnered with BELL Helicopters to design flying air taxi pods they hope to debut by 2020. Working with Uber, Bell wants to fly these pods at 240 KM per hour. That should condense hour-long trips on highways, into mere minutes in the air, at a comparable price to hailing a cab. Starting this year, we should start seeing autonomous cars on the road, too–something Uber is also heavily invested in. They’re not the only ones, either. Google’s sister company Waymo plans to launch an autonomous taxi service in 2018, and General Motors is not far behind with plans to launch their own in 2019. Would you trust an autonomous taxi to get you from point A to point B? But I Love My Car! The norm for day-to-day transportation may see a shift, but many people enjoy driving recreationally. Will family road trips and weekend joyrides become an activity reserved for connoisseurs? It’s unlikely we’ll see people give up cars completely, but we will see a drastic dip in how often they’re used over the next decade. All-in-all this is a positive shift for the environment. While there may be fewer cars on the road, those that are will also spend less time circling for parking spaces or idling. 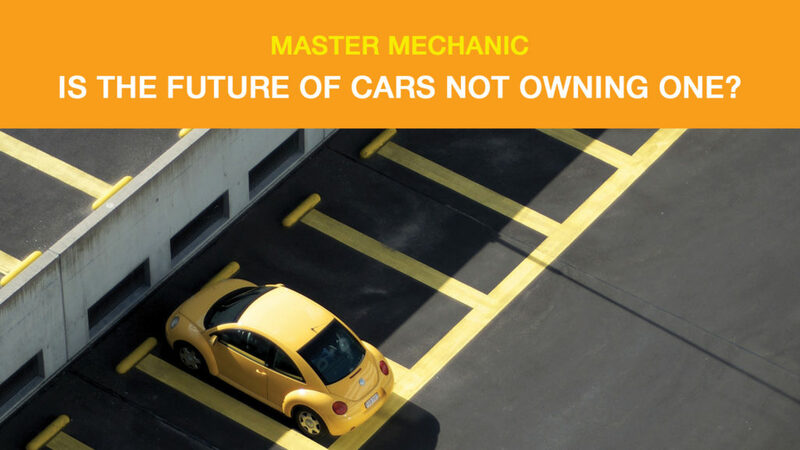 In the meantime, while you still have a car of your own, you can call your local Master Mechanic with any questions or to book an appointment!